I don’t understand store bought roast beef sandwich meat. It’s expensive. It has a funny texture. It’s not very good at all. I’m just not a fan. If you’re looking for a better roast beef sandwich, have an oven, an instant read thermometer and a sharp knife you can do better. Home made roast beef sandwich meat. Like you’d get from an awesome sandwich food truck. There’s absolutely nothing to making home made roast beef sandwich meat. It’s only slightly harder than boiling water. Or making ice. Take a nice hunk of top sirloin. Roast it in a 275F oven until it reaches an internal temperature of 125F. Have some for dinner. Refrigerate the rest. Slice against the grain. Pile on bread. Eat. At full price top sirloin costs about the same per pound as commercial roast beef sandwich “meat”. When it goes on sale though – that’s when it’s a smoking deal. Less expensive. Super easy to make. Better tasting. No additives. Pure beef flavour. It’s an absolute no brainer. Home made roast beef sandwich meat is cheaper and tastier than store bought. Once you try it, you'll never go back. 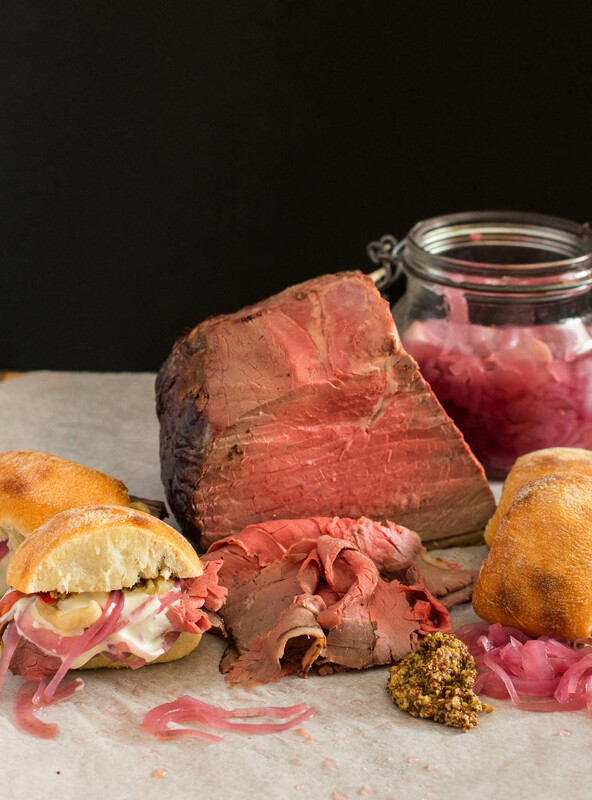 Restaurant quality roast beef sandwiches for less money. What's better than that? Season the beef liberally with salt. Roast until the internal temperature of the meat reaches 125F (around 2 hours or more). Remove the roast from the oven. When the oven reaches 450F return the roast to the oven for 5-8 minutes to brown. Spoon off the fat and place the pan over medium heat. Deglaze the pan with red wine. Deglaze is just a fancy way of saying pour liquid in a hot pan and dissolve all that good stuff left over from roasting meat or poultry. Scrape up any browned bits in the pan. Add the stock and reduce by half. Remove from heat and swirl in the butter and flour mixture to thicken. In american, beef, main course, meat. Bookmark the permalink. 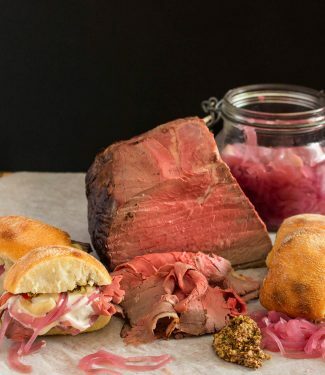 My husband loves roast beef but I never let him buy it in the deli because of how expensive the good stuff is…and the not so good stuff is gross! I’ll have to keep my eye out for a sale on a nice roast and give this a try – I’m sure he’ll be very pleased at lunch time! And it’s all good with me because this is pretty easy to cook up! It’s way lighter on the sodium as well and no preservatives as well. You are so right! Deli meat is not good, or cheap. This is a total no-brainer, with a recipe this easy, why not make it at home yourself?? 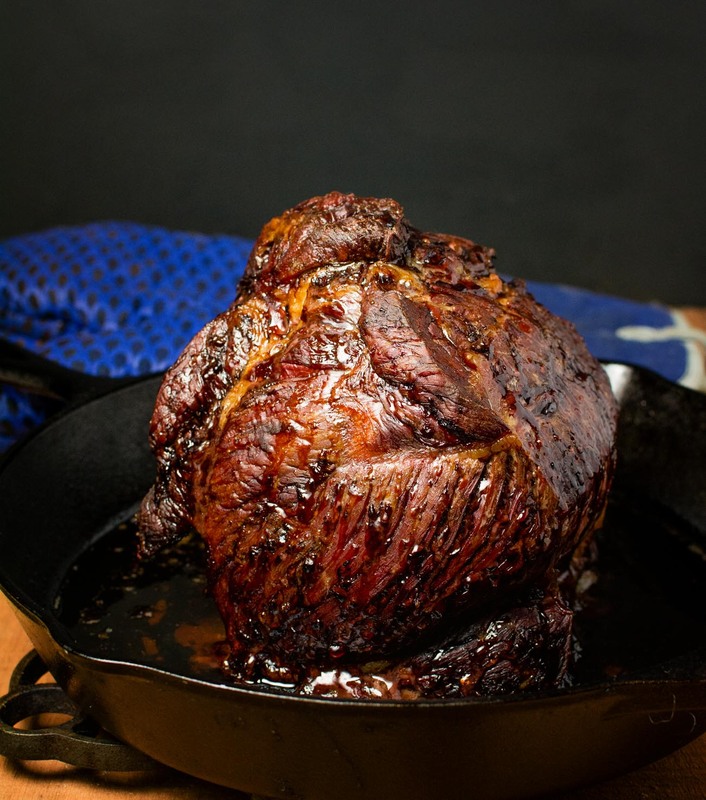 The roast beef looks absolutely delicious, thanks for an awesome and easy recipe! 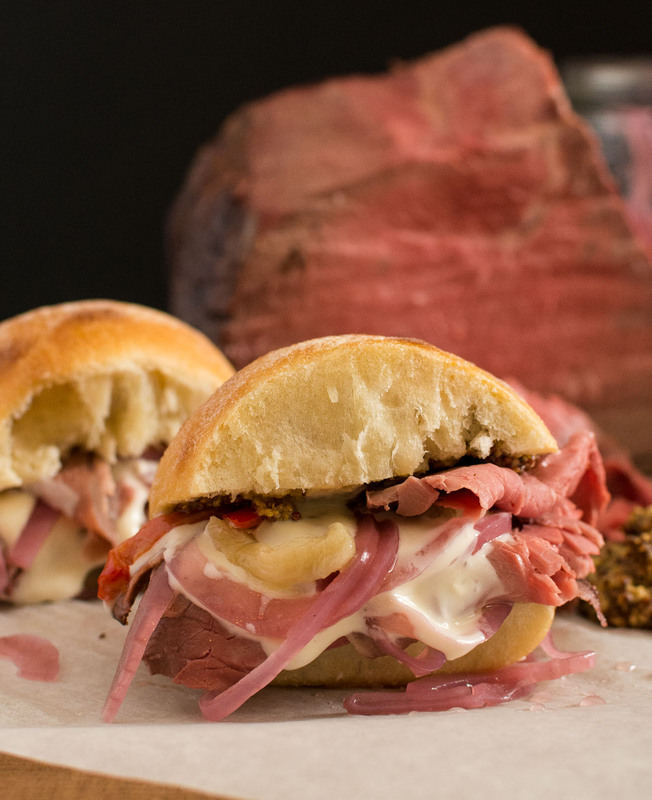 I love a good roast beef sandwich and this way is tastier and better for you.